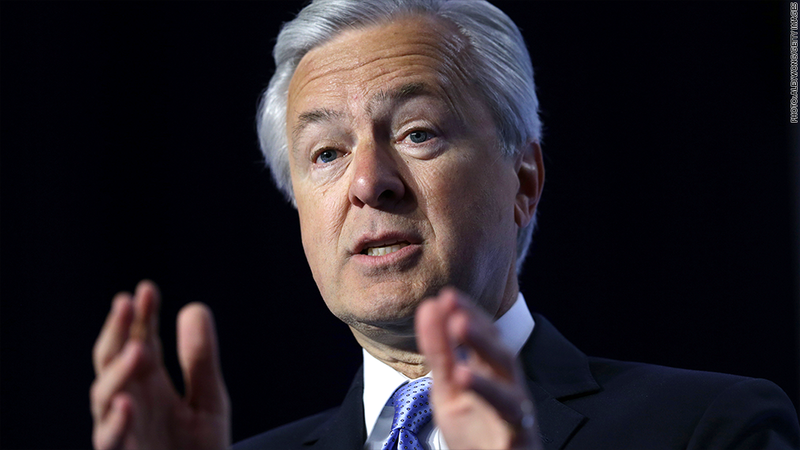 Wells Fargo's embattled former CEO John Stumpf stepped down on Tuesday from the boards of two corporate giants: Target and Chevron. The moves come just one week after Stumpf resigned suddenly as CEO amid an outcry over the scandal at his bank. There were loud cries for his resignation from lawmakers after Wells Fargo admitted to firing 5,300 workers for creating as many as 2 million unauthorized accounts since 2011. Stumpf's two board positions were lucrative. Last year, he earned $400,000 from Chevron (CVX) and another $275,000 in fees and stock awards from Target (TGT). It's the latest personal fallout for Stumpf, who last month forfeited $41 million in stock awards at Wells Fargo. Despite all of these, Stumpf left his job with around $130 million in Wells Fargo shares and other payouts he accumulated during his three decades with the bank. Wells Fargo is being investigated by the U.S. Congress and the Department of Justice for the scandal, much of which occurred under the reign of Stumpf, who became CEO of the bank in 2007. Stumpf has since been replaced as CEO by Tim Sloan. But ratings firm Standard & Poor's said Tuesday that doesn't allay its concern over how the bank is being managed. The ratings company warned on Tuesday it could downgrade Wells Fargo over the next two years due to "reputational issues" and "governance weakness." S&P cited increased uncertainty in the "scope and ramifications" of the misconduct, impact on the Wells Fargo brand and potential legal consequences. Stumpf had been a director at Target since 2010. He chaired Target's nominating and governance committee and sat on its risk and compliance committee. Wells Fargo continues to get penalized by states upset by the recent revelations. Late Tuesday, Massachusetts announced it has suspended Wells Fargo for one year from running state bond sales. "Wells Fargo has treated their employees, their customers, and the general public in a completely reprehensible fashion," Massachusetts Treasurer Deborah Goldberg said in an emailed statement. Goldberg hinted at further action against Wells Fargo, saying her staff is reviewing contracts, investments and other relationships with the bank. California, Illinois and Ohio have recently announced similar sanctions against Wells Fargo. Separately, a local lawmaker from San Francisco, where Wells Fargo is based, even took the extreme step of calling for federal regulators to explore revoking Wells Fargo's (WFC) national banking charter. John Avalos, a supervisor and member of the legislative branch of the city and county of San Francisco, introduced a non-binding resolution on Tuesday that would also look into cutting off business ties with Wells Fargo and stripping the Wells Fargo name from a planned plaza at San Francisco General Hospital. "It's disheartening to see our hometown bank was engaged in this sort of reckless behavior," Avalos said in a statement. The resolution, which is voted on by members of the city's legislature, can only end as a recommendation and doesn't become law. If the resolution passes, an Avalos spokesman said the next step would be for the board of supervisors to receive detailed reports from various city offices on dealings with Wells Fargo and then consider a legally binding action. Wells Fargo has been operating in San Francisco since July 1852. Wells Fargo said it is "committed to fix what went wrong and restore the public trust." The bank noted that it has already eliminated product sales goals and has donated more than $100 million to Bay Area schools and nonprofits. Wells Fargo also said it employs 8,000 people in San Francisco and 17,000 across the Greater Bay Area.